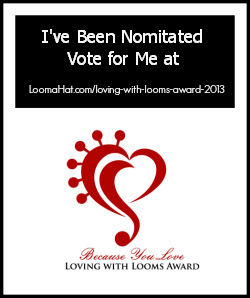 I am humbled to have been nominated for LoomaHat’s Loving with Looms Award. Denise is a very dear friend who we met online in the loom knitting community. The support we receive from Denise, and others like her means the world to us. We are very thankful to have such great friends! I am happy to announce the First Annual Loving with Looms Award. Join me in honoring someone who has used this awesome art to express their love and care for others and their plight in life. The award, along with a $50.00 Amazon Gift Certificate is to be presented to a humanitarian loom knitter. Too often people dig into their own resources to knit their treasures with no thought to personal cost or gain. I just want to give them a little bit of love and a small tangible reward. I would really appreciate if you could vote for Knitting Rays of Hope- as that gift certificate could really be handy in buying more yarn to keep up with the demand of hats for chemo warriors, babies in the NICU and children fighting other horrible diseases! Please leave your vote in the comments (link). Thank you in advance for your vote! Thank you- Denise, for the nomination and tireless support!